I have an AIO ASUS ET2230INT and when buying an SSD and arranging to change it I find that it does not have any screws, nor see how to open it. I leave two images of my computer. There are models similar to this that in the corners have screws to be able to open, but this one does not have. I found these 3 screws, but removing them I still can not find a way to open it. The cover you see is to change the ram, I have seen in the manual and only indicates how to change the ram, nothing to open it. Does anyone know if it can be opened and how? Couldn't see the screws that you had linked, try this to add images to your question. Here is a link to a video which I think that you may have seen. Did you look under any of the stickers at all? Also it says that there are several plastic tabs holding the back cover to the front. Perhaps yours is all tabs, no screws. If there are any 'feet' on the base (can't see it too well) perhaps they may be under them. Could be that once the screws are removed, there is a series of snaps along the entire thing. Get something like a spudger or a small flat head screwdriver to pry along the edge if there looks to be a seam. If you dont see a seam around the sides of the computer, dont try that. 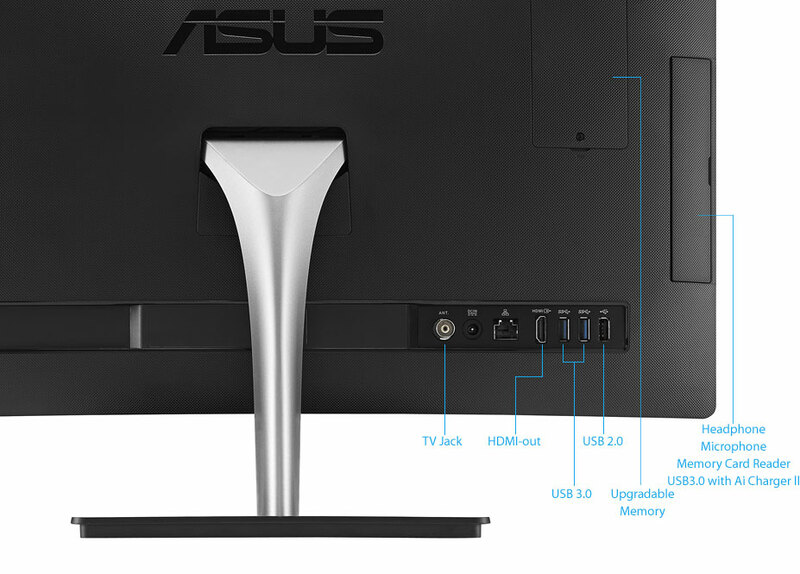 The ASUS ET2230I AIO does not have the four screw covers in the four corners on the back. There are NO covers of any sort, just smooth plastic! The only screws to find are in the optical drive bay and 2 of them can only be accessed by taking the door(front piece) off of the drive and pushing the drive back in. The edge of the back cover is close to the front glass and there is only one small "slot" on the bottom edge to put a spudger into. HELP! Roger, I finally figured this out on my own. I had to remove the 4 screws in the DVD bay first. After this, using a spudger tool, I pried the back panel away from the screen. Be gentle and do this slowly as the touchscreen glass could break. Once this is done, you can remove the base and slide the panel off the unit to get it out of the way. Put the base back on while you do your work. Only put the panel back on once all work is complete. Here is a 2700 disassembly video. It may help you figure out how to take your's apart. The ET2230I does not have the four screw covers in the four corners on the back like this vid. I have the same computer and have the same problem. Its the one time I think I may bring it to a pc store. Its aggravating. I see the one hole on the back side that has a symbol of a lock but cant seem to do anything to unlock it. Have you figured out how to open the %#*@ thing up since you first posted? Okay I figured it out. Its not real difficult. You take out the 4 screws near the inside edge of the DVD bay,all grouped together,the 3 screws you can see are easy,there is a flat head screw that is real hard to get at (or even see near the bottom corner of the DVD bay. I sacrificed my DVD bay door and ROM but now that the cover is off I can put a new one in and leave the last screw out upon assembly. Now that you have the screws out,on the bottom of the ribbed plastic about an inch from the Brightness buttons you will see a small notch,I used a medium sized flat screw driver put it in the slot and gave it a 3/4 turn and unhinged it. Move your way around(counter clockwise) the whole circumference of the cover and inch by inch the cover will come right off. Now replace the hard drive,and in my case also the DVD ROM. To remove the 4th screw hidden by the DVD drive bay, one needs to remove the DVD back plate. To do so first remove the angled DVD black plastic door (the one with the open button) to free the DVD back plate. Next put the computer face down. This is important to ensure the DVD catch and spring stay in place. Next remove the DVD back plate by removing the screws first and then pop and slide the back plate out. There is no need to remove the 2x front plates. Next slide the DVD door in and out until the 4th screw is revealed. The screw can now be removed through the DVD drive. I agree with Mark: I also left the 4th screw out when re-assembling as the whole procedure is quite time consuming just to take 1 screw out. Leaving the 4th screw out, reassemble the DVD back plate and leave the DVD plastic door until last once the PC is re-assembled. migueltroncoso will be eternally grateful.